I was thinking about the wonderful people that have come and gone from my life, and I felt a confusing sadness at those who had left, and it was because I knew my understanding was not right. A whole different understanding, and a beautiful image arose. I guess the fact was I felt that to ‘cut a person out of my life’ and ‘erase’ them, was just not who I am. I love the part that each person has played, no matter how beautiful, how confusing, how glorious, or how painful. Just because we are no longer friends, or don’t communicate at all, does not change the fact that they have been a part of my life journey. Each person played a part, and I so want to honour each and every person. 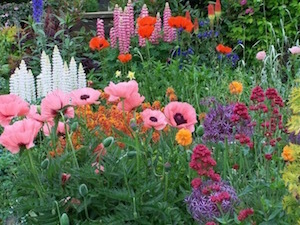 And so … an image came into my mind as I sat meditating on all of this: A beautiful garden, with so many different beautiful flowers, of all sorts of colours and height and shapes. Each and every person who has come into my life, those who stayed, those who left, are all a flower in that garden. You are all a part of my beautiful garden. And so, now I look upon an experience, and I feel no regret whatsoever, for it is all flowers in my garden. There are no ugly flowers, there is only beauty. When an experience is bad, when it hurts, there are still gifts within that which we may not see for twenty years or more, but there will come a day when we will take the strength we gained through that experience, and be able to help another. Every experience, holds something that makes us stronger, wiser, or more gentle, softer, more caring. I know it sounds horrible to say that the most vile thing to happen could have a silver lining … but one day you will take the strength you gained and save your own life. I had a talk with a woman one day who had done just that. Her strength saved her life. She told me how she looked back and knew that if that vile thing had not happened, she would not have been strong enough to cure herself and save her life. Perhaps the vile thing might be a small daisy in her garden, but it is still a flower in the garden, it is still something that happened. Every friendship, every relationship, is a flower in my garden. Some are so very beautiful and so rare, as if they are the only flower of that kind in the entire world, and some are daisies, and some are the beautiful peony rose…flowers of every kind, and they are all so glorious. This is now how I am seeing life. I no longer have to ‘love and lose’, for now I understand that I simply love, and if you leave, then you are still a part of my beautiful garden, and I will remember you will such appreciation and such love. I do not regret the planting of a single flower. You wonder how I can sit here and write this stuff? I have been sitting here for half an hour, enjoying a mug of tea, looking at my beautiful gardens, feeling the breeze on my arms, and appreciating every single thing. I feel such gratitude for all that is in my life. I feel so much love for life, and for where I am at within myself. I have never felt such contentment, such, tranquillity, such self love and self acceptance before in my life. I look around me at the beauty that is my life, and I know that life is simply responding to me to the frequency that I hold, to the thoughts that I hold, to the love that I share. Life is responding to me. As I was buying flowers from a Garden Centre yesterday I realised, that I had been actively making all of my life beautiful, to express outwardly the beauty that I feel within. And so I want to make all of my life beautiful. So, when people wonder is it really possible to make life better, to find more happiness … yes, it is. I can show you how, by sharing my understandings with you. But, I can only lead you to understandings, I cannot make you embrace them. I am telling you … it works. I am in alignment … joyous … and life is responding.